John Unger writes, "Using marble, stone and precious gems, I am creating a series of 14 mosaics that replicate 16th century anatomical engravings. Each mosaic is 7’ x 4’ and presents the figures at life size— viewers can stand before them and see anatomy as though looking in a mirror." I’ve invested over 41 thousand dollars and more than 4000 hours of labor to bring this project to the halfway point. The vast bulk of that expense was buying several tons of stone all at once to insure consistent color throughout the series. I’ve just launched a Kickstarter campaign to support the completion of the series. Rewards range from large ruby crystals for only $25 to life-size reproductions of the mosaics. I only need to raise $3110 to finish the next three, and if I top $7594.00, I can add the two illustrations that detail the human skeletal system. The stones and minerals I use in the mosaics occur in all the same colors as the interior of the human body—this similarity is completely fascinating to me, and was a major inspiration for the project. 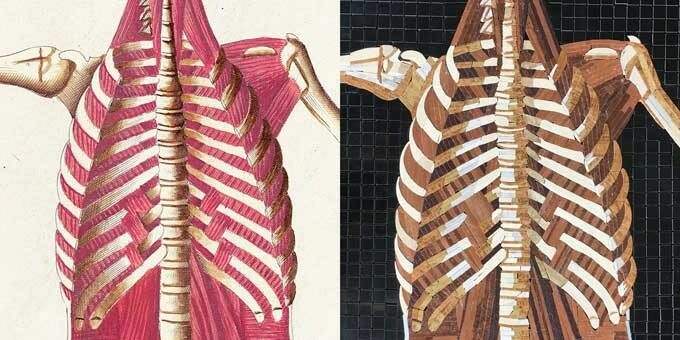 I select each piece of stone to closely match the color, shading and texture of the reference images—high-res scans from the U.S. Library of Medicine’s 1873 edition of Bartolomeo Eustachi’s Tabulae Anatomicae. I start with 12” x 12” stone floor tiles and cut them into strips as thin as 1mm on a wet saw. I then use tile nippers to cut the strips to size and a series of three different diamond lapidary machines to smooth and shape them. By the time the series is complete, I will have pushed 2 to 3 miles of stone through the wet saw. Carrie Haddad Gallery in Hudson, NY will debut the Anatomy Mosaics, June 12th through July 28, 2019. Once the project is complete, I plan to send the collection on a global tour. Displayed along side the original etchings, the finished series will be over 140 linear feet of art and the 14 mosaics will weigh 4,300 pounds.